Is that zombie head smiling, or is that just its normal, hungry expression? Maybe the Decapitated Zombie Head is smiling, although it does not seem to have much to smile about, especially when you consider that its head has been removed from its body. This impressive zombie head looks like it has seen better days, decapitation not-withstanding. 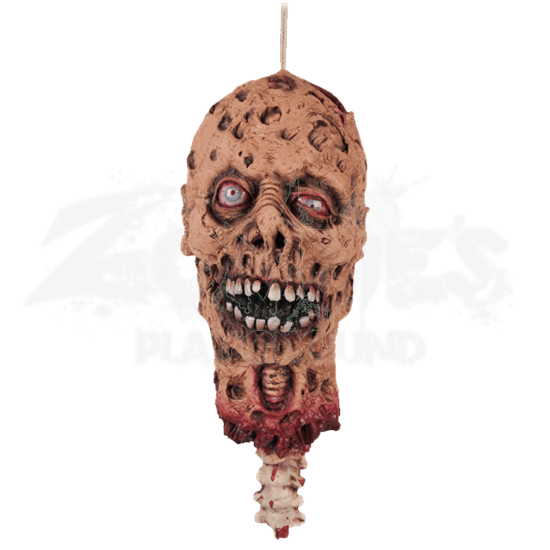 The zombies head is covered in porous, rotting gobs of flesh that gives it a truly monstrous and horrifying look. Its skin is pitted and sunken across its features, while its eyes possess a striking blue color that is all at once eye-catching and inhuman. Its mouth is opened wide in a gruesome and curved smile that shows off jagged and uneven teeth. A hole in its neck reveals the windpipe and esophagus behind the flesh, while the tatters of where the head was removed from the body are blood-stained. Extending out beneath the severed had is a length of white spine, dotted with drips of blood. This life-sized zombie head is made entirely out of latex and measures approximately 17.5 inches tall. 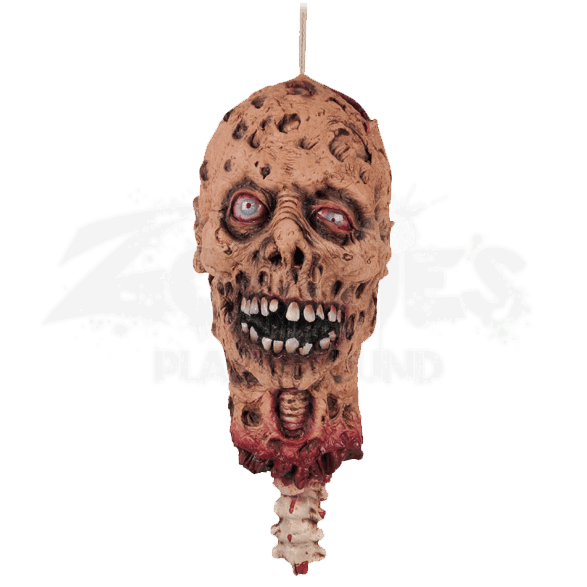 Whether you use this grisly looking Decapitated Zombie Head as a trophy of your zombie-hunting or a decoration for your zombie outbreak (or any horror setting, really), you are all but guaranteed that this head will definitely send some chills down onlookers spines.